"A wise and loving portrait of a marriage. . . . Susanna Daniel writes beautifully of matters of the heart." Against a vivid South Florida background, Susanna Daniel’s Stiltsville offers a gripping, bittersweet portrait of a marriage—and a romance—that deepens over the course of three decades. 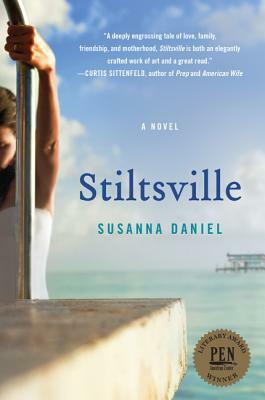 Called "an elegantly crafted work of art and a great read" by Curtis Sittenfeld (American Wife, Prep) Stiltsville is a stunningly assured debut novel sure to appeal to readers of Anita Shreve, Sue Miller, and Annie Dillard, or anyone enchanted by the sultry magic of Miami. Frances is writing a memoir of her marriage and family life, but she chooses to highlight only particular years and summarize others. Why do you think she focuses on these events? How does the novel mimic the memoir form? How does it differ from it? Why do you think the author chose to tell the story so much like a memoir? Miami has changed a lot since the years of the novel. How would this family be different if they were living in Miami at the present time? A lot has been made of the life-changing decision Frances makes at the very end of the novel. Why do you think she made that decision? Would you make the same one, or a different one, if you were in her shoes? Stiltsville has been called a love story but not a romance. Do you agree? Why? Though her life is conventional — husband, child, home — Frances comes to understand that her life is not mapped, that very little can be predicted for the future. Do you think that’s true of your own life? How would you characterize the relationship between the narrator and the other women in the novel — Bette, Marse, Margo, and Gloria? Are these relationships realistic or typical? In what ways do they defy convention and stereotype? Discuss in particular the relationship between Frances and Marse, which survives an early trauma when Dennis falls for Frances instead of Marse. How does their friendship make it through this? Who is more responsible for the friendship’s salvation? The last line of the book offers, ultimately, a justification for the act of telling the story. Discuss what this line means and how it relates to the book as Frances’ post-marriage project.